Der Artikel Daniel Humair (geb. 1938): Seasoning: Live At Theater Gütersloh 2016 wurde in den Warenkorb gelegt. Among jazz fans, you can have a lot of fun arguing whether »European Jazz« is a useful counterpoint to the American tradition, an original supplement thereto or »is worth less than American jazz on the market« as it can be read in a Wikipedia forum. There is no doubt that there have been and are gifted musicians this side of the Atlantic, who have molded and formed jazz for decades. They have developed very unique playing styles by merging European music traditions with American influences. To give these pioneers of European jazz a stage was the idea for the series of articles »European Jazz Legends«, which has been launched in the magazine Jazz thing in their 100th issue in September 2013. We can now look back on 19 issues. The symbolic stage has now become a real one, and it is in Gutersloh in the middle of Europe. Accompanying each edition of the magazine appearing five times a year, a concert planned especially for this occasion is being organized in cooperation with the label Intuition, the city of Gütersloh and Westdeutscher Rundfunk Köln with current protagonists of the series, hosted by our author Götz Bühler. Each concert including an interview with the artist will be broadcast by Westdeutscher Rundfunk (WDR 3) at a later time, and the musical highlights of the concert will be released on a CD. In other words, five concerts and five CDs in the series »European Jazz Legends« are planned for each year in the future, until end of 2017. In addition, a book will be published, in 2018, for which the article from the magazine will be revised and supplemented, among other things, to provide impressions from the concerts and discussions. The CD of Günter »Baby« Sommer is the tenth publication in the »European Jazz Legends« series. We from Intuition Records are very proud of this and would like to thank all partners and especially the musicians – and hope that you enjoy this series. American Jazz critic Nat Hentoff once made an example of Daniel Humair as one ›who long ago destroyed the notion that European drummers can't swing‹. However, the artist born in Geneva, Switzerland, on May 23, 1938, who has been living and playing in Paris with the greatest European and American Jazz-stars ever since he was twenty years old, refuses to let himself be limited to music, let alone swinging. Renowned as a painter, with his abstract art included in some of the world's best collections, Humair is an accomplished cook as well, who has also been helping with the interior design of his friend, three-Michelin-starred chef, Guy Savoy's restaurants, including the design of the tableware and menu. »I am a touche-à-tout«, he says. »I do a lot of stuff. 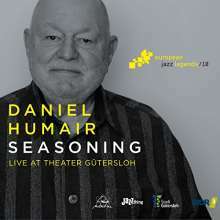 I am never bored.« This excellent eclecticism can also be witnessed in the more than 300 recordings Daniel Humair participated in, from the trio HUM with Pierre Michelot and René Urtreger to the one with Joachim Kühn and Jean-François Jenny-Clark, from Phil Wood's European Rhythm Machine to albums with Martial Solal, Jean-Luc Ponty, George Gruntz and many more. Adding to his discography as a leader, Daniel Humair brought a new group to his ›European Jazz Legends‹-concert at the Theater Gütersloh on November 11, 2016 – a quartet made up entirely of former students of his from the Paris Conservatory. Vincent Lê Quang on soprano and tenor, pianist Emil Spanyi and Stephane Kerecki on double bass made their former professor proud in a set of mostly Humair-compositions, with a completely improvised ›Ballad‹ by the group as the icing on the cake.